Laprida, Argentina. 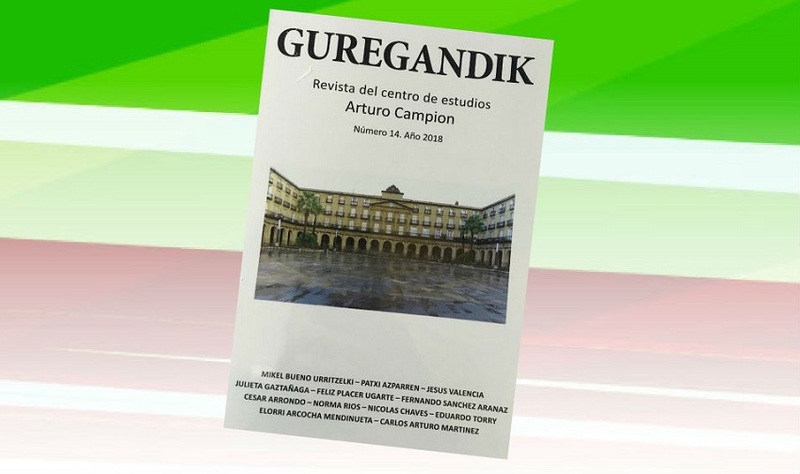 The publication corresponds to the work done at the Arturo Campion Center for Basque Studies, based in Laprida in the province of Buenos Aires, by its members and collaborators during 2018. The magazine pay tribute on its cover to Euskaltzaindia, the Academy of Basque Language, that begun celebrating its Centennial in 2018 to finish the events in 2019. This is why the cover of the 14th issue of “Guregandik” is a picture of the Academy’s headquarters located in the Plaza Barria in Bilbao. Comprised in this issue of “Guregandik” are five texts from Euskal Herria and six from Argentina. The first are “Coordinate Two Sovereigntist Processes. The Catalan and Euskal Herria,” (Patxi Azparren); “Just from the Cave, Documents and Archive of a Basque Communist Boarn in Madrid,” (Mikel Bueno Urritzelki and Elorri Arcocha Mendinueta); “The Magazine ‘Herria 2000 Eliza,’ Witness of Recent History I Euskal Herria” (Félix Placer Ugarte); “The Trap of Statutes,” (Jesús Valencia); and “Vasconia and the Artificial Pyrenean Border,” (Fernando Sánchez Aranaz). Articles provided from Argentina include "Producing sovereignty and the Right to Decide" (Julieta Gaztañaga); "Arrecifes Basque Club. Culture and Patriotic Action (1939-1949)” (César Arrondo); "Iparraldeko Euskal Etxea (French Basque Club) 25 Years of Culture (1992-2017)" (Norma Beatriz Ríos); "'Euskal Hirigune Elkargoa.' Association of Iparralde, First Fruits"(Carlos Arturo Martínez); "Notes on the Heroin of Euskal Herria during the Transition", (Nicolas Chaves); and "Two Notes on the Beginnings of Basque Institutions in Argentina" (Eduardo Torry). Interested person can get a copy of “Guregandik,” by emailing nicolasjchaves@gmail.com or on Mercado Libre Argentina.